After you cross the entire country, you can still make it in time for work. I've never explored my own country by train. Singapore is one of the smallest countries in the world. Measuring 31 miles across, the cross-country journey can be done either as really long marathon or a short train ride. The Singapore MRT is one of the most cost-efficient public transport networks in the world and a coast-to-coast journey costs just US$1.54. On 1st April 2019, I decided to take the train across Singapore. This is my trip in iPhone photos. I started my journey at Tuas Link. The station looks like one of those 200-year-old grand railway stations. Except, it is 2 years old. The station lies so far west that it's within walking distance to the border with Malaysia. I boarded the train at lunchtime with people who were either just laid off or really late for work. In the far west of the country, Singapore hides its heavy industry. Soon, we entered the heartlands of Singapore — government-subsidized public housing which 82% of the people live in. 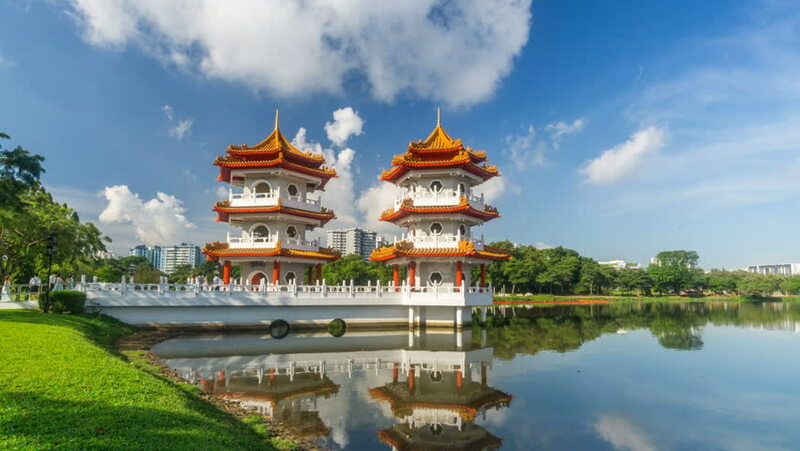 Between the stations of Chinese Gardens and Lakeside, there is a Chinese garden by a lakeside. You can stop off here to visit the locally-famous gardens. But it is better not to because it is a scorching 35°C / 95°F outside. As the train enters the Central Area, it goes underground and there is no view. Most people either contemplate in silence or play Angry Birds, as seen here. Above ground, there are views like this that we won't get to see. The train emerges from underground and passes over the Kallang River, with grand views of the Singapore Sports Hub, a gargantuan stadium used more for Maroon 5 concerts than sporting events. The stadium is the world’s largest free spanning dome, which I think it's special because not many things in this country are free. The remainder of the journey was mostly public housing. Did I mention that 82% of the country lives in one? Finally, I arrived at a place called Changi Airport S🔵pore on the map. It's the end of line and about as far east as you can go, before getting arrested for trespassing. There's a feeling of elation among passengers. Not because they've crossed the country like me, but mostly because they are flying off to their vacations. Changi Airport is an incredible destination. It's won Airport of the Year for seven consecutive years from 2013 to 2019. And in a few weeks, it's only getting better. A development project called Jewel Changi Airport is opening on 17 April, 2019. When it opens, it will be absolutely ridiculous. And I'm not paid to say that. Just look at it. It's almost as if this country is the same one from Crazy Rich Asians. But finally I boarded the train for my journey home. Another 1.5 hours.